Overshot is perhaps the most iconic weaving technique--think antique coverlets and fancy table runners--yet many weavers are intimidated by its complex-looking structure. But it doesn't have to be difficult! 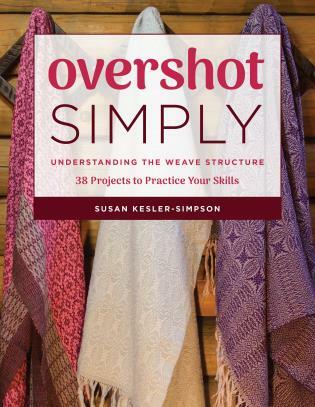 In this book, Susan Kesler-Simpson makes overshot approachable by breaking it down piece by piece so that the weaver understands how it works, and then she puts it all back together so that weavers will have the confidence to make their own overshot patterns or to try any of the 38 overshot projects she has designed for the book. Susan Kesler-Simpson is passionate about fiber arts and breaking down weaving techniques so that even beginners can learn the basic concepts. She has a B.S. and M.A. in Clothing, Textiles, and Design from the University of Nebraska, and enjoys teaching weaving and working in other crafts such as knitting, spinning, and crocheting. She resides in Danville, Pennsylvania.